A nutritious grain with a nutty flavor, typically used in Lebanese tabbouleh. This ingredient is produced by soaking wheat berries (with the bran removed) in water and then drying until they crack. The result is a quick-cooking grain that is delicious added in salads or incorporated into pilafs and stews. Bulgur is a nutrient-rich whole grain that is a great source of vitamin B-6, iron and niacin. Because it has a high protein content and is chock full of fiber, it is an excellent food for satifying one's appetite. Bulgur is not gluten free as it is a wheat derivative. 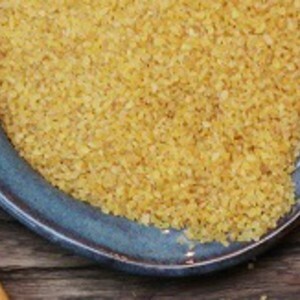 Learn more about bulgur wheat here on our blog!